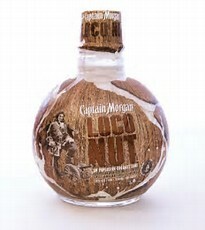 Captain Morgan is going ”loco” this spring! Introducing a delicious coconut spiced rum shot. Captain Morgan Loconut is an intensely delicious blend of real coconut liqueur, our famous Captain Morgan original spiced rum and Caribbean spices. This just may be the most delicious shot to hit the beach (or bar). Make sure to ”smell the coco for a scent of loco” to enjoy our coconut-scented bottles.